As VoIP has grown more advanced, virtually hosted systems common among business VoIP providers have become the standard in convenient and affordable communication. The flexibility of those services provides businesses like yours the ability to not only maintain scalable and easily-configured systems, but also to expand teams to include remote and off-site workers who still have access to phone systems. It’s hard to beat that kind of open communication and collaboration benefit. Today, countless companies offer these services to businesses around the world in place of dated and more expensive hard-wired telephone services. Making the switch is often an easy choice, but finding the right provider is not. Despite a standard feature list that most business owners look for, providers often limit features depending on the service level. It’s important to find a VoIP provider that aligns with your business model, needs, and requirements for growth. In this review, we’ll be going over Ooma business VoIP including its setup, support services, online portal and mobility to help you gauge if the service is right for you. 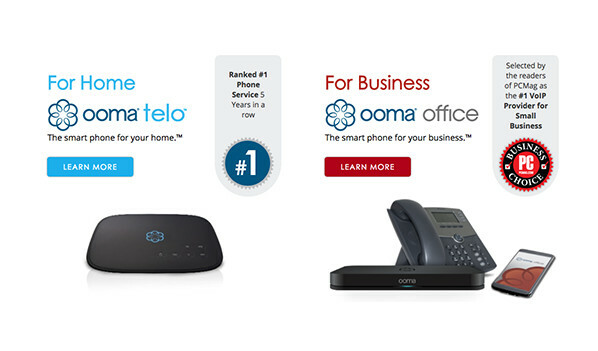 Ooma Business VoIP is Award-Winning, But Is It Right For You? Ooma launched in 2003 at the heart of Silicon Valley in Palo Alto. For the first 10 years, it built up a great reputation providing VoIP for home-based residential users. In 2013, the company introduced Ooma business VoIP, and continues to offer well-rated VoIP services to growing small- to mid-sized businesses. That’s a key thing to consider through our Ooma business review, as it may not be ideal for larger enterprise clients or expansive multi-site operations. That should also be considered if you’re scaling up in that direction. The company earned PCMag.com’s Business Choice award as the #1 VoIP provider for Small Business. That’s because the company’s technology, based on its free service residential users, is designed to give you the professional presence of a larger organization at a reduced rate. An important question to ask yourself is how your business will scale, and how large are you now. Proof of the services scale limitations are in the max allowance of just 20 total users. If you’re growing beyond that anytime soon, this small-business-friendly VoIP may not be for you. Ooma welcome new subscribers with two offers. The difference comes down to whether you connect using a desk phone or your mobile phone. For desktop users, you’ll pay $199.99 for the Ooma business hardware – a dedicated router to handle your VoIP connection. This is similar to boxes seen with Ooma residential VoIP, Vonage, and other smaller VoIP service. In addition to the hardware cost, you’ll pay $19.95 per month which covers connectivity for a single user, a local or toll-free number of your choice and a host of other features that we’ll cover below. Adding additional users is easy, and costs an additional $19.95 per month, per user. If you prefer to just use your mobile device, you can load the Ooma business VoIP application and connect via any WiFi network to your Ooma account. This requires no upfront cost, as it doesn’t require the Ooma hardware package. Regardless of your setup, there’s no contract and the company offers a 30-day money back guarantee if you’re not completely satisfied. If you’re starting a new Ooma account and need equipment, Ooma does have desk phones (corded) available for purchase from Cisco and Yealink. This includes dedicated conference phones. Thanks to the flexibility of VoIP, you’re not required to use those specific phones. Any VoIP ready phone will work just fine with Ooma phone services, though some configuration may be required. This is handy if you already have VoIP phones and want to use existing equipment, just check with your hardware guide and Ooma rep to ensure they’re compatible. We’re big on business VoIP providers who provide top tier customer support, so it was a little disappointing to discover that Ooma doesn’t offer live 24/7 coverage on its toll-free support line. While techs are available 7 days a week, the hours are limited. On the upside, Ooma business support includes live/online chat available 24 hours a day. With that level of support you should be able to reach someone if you have business VoIP connectivity problems, quality issues, or questions outside of normal office hours. Ooma support also includes online content, covering everything from how to administer the system’s feature to configuring your account. This includes a thorough section on how you get started with the Ooma Office product too. The company has made configuration easy with a simple 3-step setup process so, in most cases, you should be able to get your service up-and-running without the need to speak to technical support over the phone. Using your Ooma login, you can control virtually every aspect of your experience with the company from system modification to accounts. The Ooma portal is fully cloud-based, so you can access, configure, and maintain your account from anywhere you have an internet connection. Imagine taking a last-minute business trip with your team, only to realize at the airport terminal that some of your team will be without access to their phones while away. With a few clicks, you can change call routing to ensure customers always reach a live person at the office. Making international calls with Ooma is easy. Unlike with other VoIP providers, there are no unlimited global calling plans, however calls to other Ooma users in foreign countries is completely free and included with your plan. The $19.95 rate plan also includes unlimited calls in the U.S. and Canada. 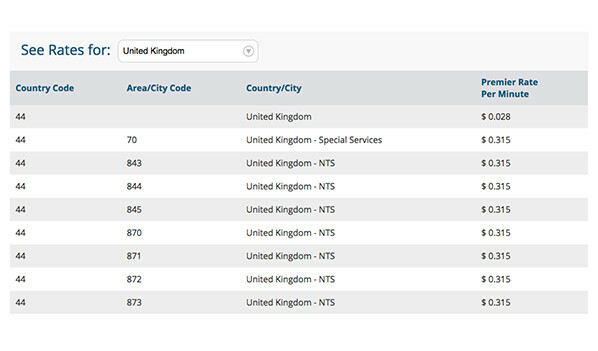 International calls are charged at fairly competitive rates, which are subject to change. If you check with your Ooma representative, they can provide you with the most current international rates for countries in which you do business. It’s one of those little things that can make a small business seem a lot bigger. When you dial a number, you get connected to an automated voice assistant asking you which department you want to speak with or if you know the extension number of the person you’re calling. Ooma’s auto attendant will also save you on operational costs. Rather than paying to staff a receptionist to handle incoming calls, or overloading your support staff with handling all inbound calls, let the automated system handle it. It gets your customers where they need to go without the labor intensive overhead and can reduce support response times. Since Ooma isn’t built for enterprises, it’s not the most advanced auto attendant system, but it remains flexible and easy to use. Just dial into the system with your Ooma business login and you can easily configure options from your Ooma portal. For your greeting, you can manually record your greeting or use the “text-to-speech” option. With text-to-speech, the Ooma system will take up to 400 of your words and produce a greeting using your choice of male or female voices, and American or British accents. While not as robust, there’s enough functionality to cover most small businesses. This includes programming business and holiday hours, and alternate greetings for away periods. There’s also the option to program in direct transfers to a virtual extension, physical extension, a ring group or voicemail. Ooma’s pleasingly simple online user management system allows you to change how your company manages its inbound calls. Since Ooma targets primarily small businesses, there are noticeably fewer features than what you see offered by other providers. That’s understandable though. A small company with 10 people doesn’t need the same phone system as a company with 500 or 5,000 employees. The upside to that is an intuitive user interface that makes call management a breeze. The Ooma portal comfortably handles three way calling with options for you to include and exclude callers at different points. For more complex interactions, you can make use of their “Conference Room” facility. This can handle multiple participants and it’s easy to set up. Each caller needs just an extension number and a PIN to take part. Call forwarding is reasonably basic on the Ooma system with no real equivalent of the “Find Me Anywhere” option provided by other VoIP companies. However, transferring calls is easy – you can transfer direct, attended transfer (if you need to explain the call to the person you’re transferring to) or transfer direct to voicemail. Simple but effective. While features are limited for smaller businesses, even small businesses sometimes need to send or receive a fax. If that sounds like you, Ooma offer a “virtual faxing” service as part of its standard feature set, so there’s no premium add-on fee associated with that. To send a fax, upload a PDF and send it through your Ooma portal. When someone sends a fax to your business line, it’s automatically converted to PDF format and delivered to you via an email address you designate. The Ooma app for iOS and Android devices makes your phone part of your wider company VoIP network. You can make calls, transfer calls, and listen to voicemails with the custom apps. Unfortunately, there’s no way to access your administrative dashboard from the mobile apps. If you need to make changes, you’ll have to access your Ooma portal through a browser. There’s very little inconvenience there, since every mobile device and smartphone today comes loaded with Chrome or Safari. For such an affordable service targeting small businesses, it’s great to see this kind of mobility. Especially since small business owners and entrepreneurs are often out in the field working to grow their business and can benefit greatly from these apps. Other than connecting with Dropbox, Ooma offers no integration with well-known business desktop, mobile or cloud programs or apps. It’s what you would consider a bare-bones VoIP solution. Thankfully, most small businesses don’t utilize costly systems like Salesforce so this shouldn’t be a concern for most. If you do utilize any kind of customer relationship management (CRM) platform or want integration with software like Office 365, you may want to consider a different VoIP solution. Does Ooma Have the Features You Need? The Ooma offering comes with 25 different elements as standard. Calling features included are: unlimited calling in U.S. and Canada, low international rates, caller-id and name, 911 service, free number transfer, and toll-free numbers available. Key office features that come bundled with your Ooma account include: virtual receptionist, extension dialing, voicemail, call transfer, call log, modes for business and after hours, ring groups, music on hold, conference bridge, and virtual fax. For when you’re out and about, the mobility features in Ooma are: call forwarding, voicemail forwarding, multi-ring, and virtual extensions. One-touch IP Phone features include: three-way conference, do not disturb, transfer calls, extension dialing, and call on hold. While it’s not as robust in features as other providers, it’s still a solid feature set for the price so there’s good value for the spend. If you fall within the 20-users-or-less requirement, then Ooma’s signature “sound like a big business at a small business price” tag is speaking directly to you. What we love about Ooma is what sets it apart from so many other providers; it’s not trying to be something for everyone. It’s devotion to smaller growing businesses and startups allows Ooma to deliver world-class service and a solid feature set at a very affordable price. They may not be a leader in VoIP, but they’re certainly pulling in awards for providing tremendous service to their target audience. If you can get by with some feature limitations and you don’t need software integration, Ooma business VoIP could be just the service provider your business needs.